Today I re-visited an old stomping ground, and my, how the memories came back. Hands-down, bookstores are my favorite places in the world. Being surrounded by all the books - shelves and shelves of stories, unread and just waiting to be explored, is my idea of heaven. Ditto a good library. This place was a hang-out of mine for years. It's only about second-hand books. Every available wall, corner and table was taken up with books. They also did cracking food and coffee, and encouraged reading and hanging out. The perfect place really. I still swear I did my best thinking there. Assignments; successful job applications; big news received and shared; and some massive life adventures planned. Plus reading, day-dreaming and writing galore in that place. I loved it. 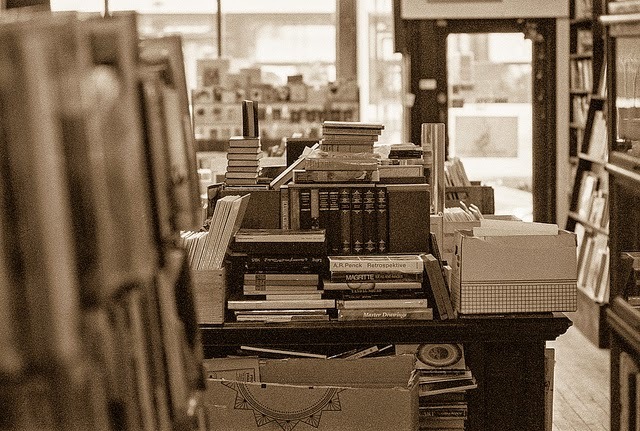 A good bookstore is a thing of true beauty. Particularly if it's not all about buying books. Creating space to dream, talk, write, read and ponder is almost an art-form in itself, and man, these guys do it well. I've not found its equal where I live now, so visits like today are especially precious. How about you? Share your favorite bookstores - I'm sure there might be a few we agree on, and a few delightful new ones to discover! *Photo courtesy of Ryan, Creative Commons license. Years and years ago I visited Shakespeare & Co and was totally blown away. What an amazing place and history it has. I love finding things written in 2nd hand books - I've found shopping lists, notes to friends, a child's drawing - amazing! Old bookstores are the best. And like Rebecca I could live in Shakespeare & Co. Old books, new, a reading room, history, a killer view, a piano, decades of famous writers... I wish we had something like that here! My dream is a reading/library/ dedicated writing room at home! At the moment its the study/playroom so books share with lego and kids toys - ok - but not exactly Shakespeare & Co - and not with that incredible view either! oh book stores, they will always have my word hungry heart! :) I love them all, big ones, small ones, but my favourites are definitely the small secondhand ones. I am lucky enough to live near Clunes, and go every year to the Clunes Book Festival, it is so wonderful. The Clunes Book Festival - lucky you Tash. Me too, I love the small second hand ones, could lose myself for hours there.